It is sad to hear - but not surprising - to learn that once again the politicians of New York have betrayed common sense and morals. Gay marriage is now legal in New York state after much lobbying from gay activists along with the persistence of governor Cuomo. Everyone should be equal, that is a given. However, marriage is between a man and a woman. It is a religious institution and the State has no right to redefine it. Our founding fathers developed the idea of Separation of Church and State for this reason. They did not want to see the Church telling the State what to do and vise versa in this new land. That being said, once the State puts on a miter and begins defining doctrines, we are in deep trouble as Americans. We must pray for our politicians that they have the faith and courage like St. Thomas More who refused to go along with Henry VIII's ideas of divorce and Papal power. Like a true champion, he stood by his faith and reason. He did not give in to popular opinion or propaganda. Unfortunately, our current politicians do not have this courage and easily succumb to any chic ideas that are really social engineering in disguise. Nevertheless, this is not over and the Church will continue to hold the light of Christ in the world which is full of darkness. 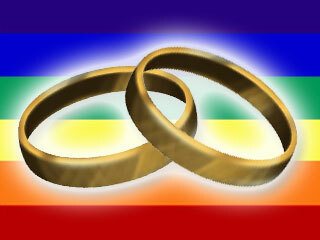 Elections are coming again and rest assured there will be many changes that will result in the restoration of marriage.